Here are 6 summer health tips that are easy to implement. Summer is the best time to get in shape, lose a few pounds and feel super energized. You have 2 choices.... you can keep on doing what you've always done, letting your inner saboteur rule you and continue to sabotage your health goals, by using summer as an excuse to party and indulge even more or you can take charge! Either send your inner saboteur to the back of the bus or, better yet, throw your inner saboteur off the bus and get back in the drivers seat! 1. Take advantage of the abundance of fresh, local produce! What could be better than super fresh, crunchy vegetables, straight from the farm? Fill up your fridge, pile up your plate, make some delicious, home-made salad dressing, and enjoy the multitude of colors. Unlike winter, when veggies are old and soggy and travel so far and are unappetizing, fresh vegetables are delicious and higher in digestive enzymes. No one ever gained weight by eating too many vegetables! Make 1/2 your plate veggies, 1/4 good quality carbs and 1/4 protein at lunch and dinner. 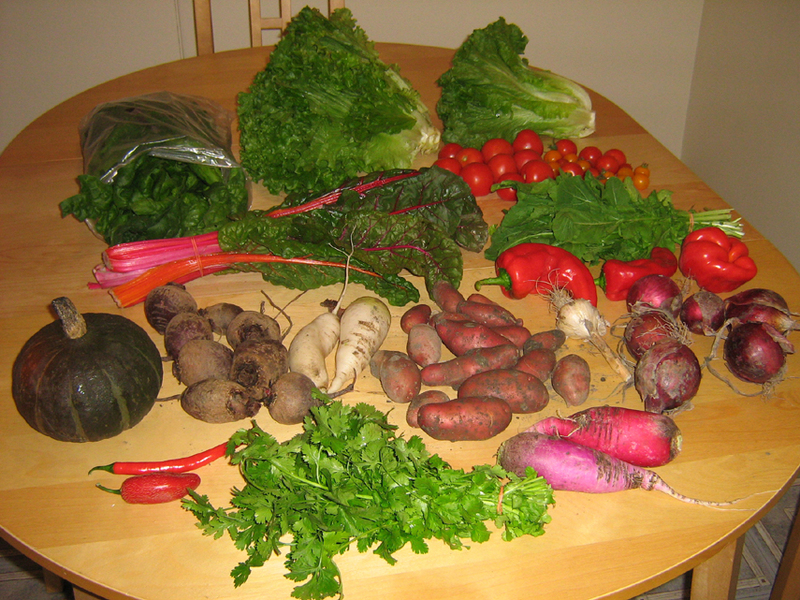 One of my bi-monthly organic veggie baskets. 2. Move your body outside! I live in Montreal and it is certainly hard for my clients to be motivated to move outside in the middle of winter, when it is -20 C and snowy or wet! Take advantage of the beautiful weather to get outside and do something that makes you and your body happy! 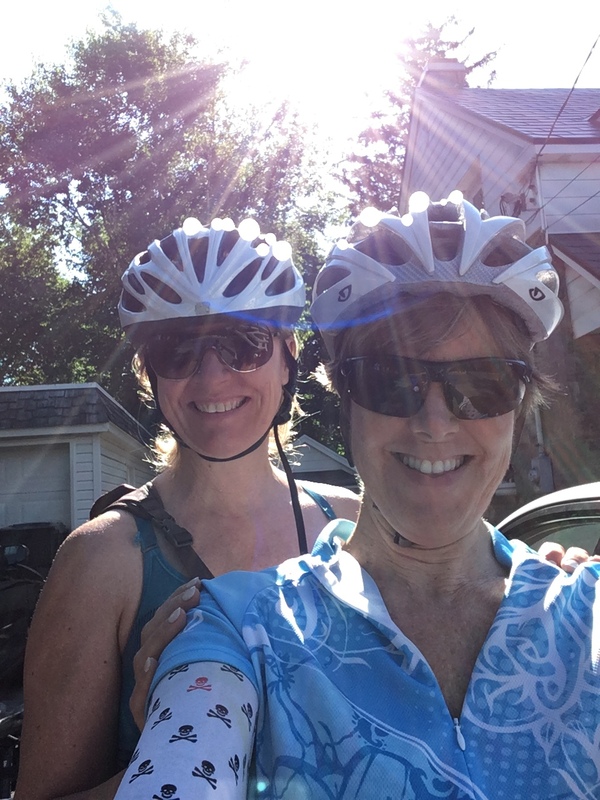 Nothing better than an early morning bike ride with a girlfriend! If you find it hard to move, team up with a friend. Every summer I put my gym membership on hold as I am out all the time on my bike, most often with my friends in a cycling club. I also get in some hiking and camping and I love to swim in a lake whenever possible. My vacation the past few years has been to cycle tour, solo, camping as I go. SO excited to leave tomorrow, to tour Eastern Quebec, the coast of the Gaspésie! Stay tuned for my pics and to hear all about my latest adventure! There are tons of outdoor classes now, and so many of them are even free. You can check out Meet-up groups. Practicing yoga outside is heavenly! And if it's new to you, you might just want to continue inside for the winter. In Montreal there are all kinds of things to do outside. Outdoor Salsa in Verdun, free Spartan training workouts on Mount Royal with the Meet up group, Montreal Outdoor Adventure Club (MOAC). Free Tango in N.D.G. parc, the list goes on. Set it up and schedule it in!! If it's not scheduled, it won't happen! 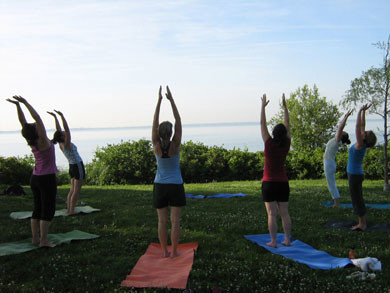 My outdoor yoga class around 2010. The next summer health tip - disconnect to re-charge. Your body is like your cellphone, you need to plug it in to recharge it or it will die. You need to recharge your battery and what better way than to get out of your usual environment and into nature. Put away your cellphones, tablets, unplug completely! We are constantly in front of screens, in noise filled environments, the constant buzz of the city, in stressful situations... by getting away from all those, we nourish our bodies with wonderful fresh air, sunshine, a refreshing breeze, birds singing, the tranquility so very essential to our soul. If you can, take off your shoes or sit on the ground, to ground yourself more fully to the energy of the earth to fully re-charge! No need to bake in the sun, when it is at it's hottest, in the middle of the day, but, so great and essential to get your natural vitamin D from the sun when you can. Most people are vitamin D deficient in the winter, unless they are taking a supplement, or they live in the southern hemisphere and are in the sun regularly See the vitamin D- osteoporosis link here. It's challenging to have the discipline to keep healthy habits, sometimes that inner saboteur is hard to take down. The reason why my clients have such great success with healing their ailments and with their weight loss is because I have put together an incredible program that encompasses every aspect of their health, body, soul and mind. I hold them accountable, I give them my unwavering support, I cheer them on, and I believe in them, until their new healthy habits are an ingrained new way of life. Contact me to learn how I can help you achieve all your health or weight loss goals!